As you may have noticed because of previous posts that I regularly attend Playfest. Playfest is a weekly ‘party’ on Twitter and Facebook, where a group of like minded people get together to talk Play. The best bit is anyone is invited, just follow the hashtag #playfest on Twitter each Tuesday from 8.30 until 10pm or at the same time on a Thursday head over to the Izziwizzi Facebook page! It doesn’t matter who you are, whether you have one child or seven or whether you just advocate play! I love the fact that we can share ideas, get advice and chat about how important play is! This week (Commencing 11th June) the topic will be turn taking and sharing in play, so there will be plenty of opportunity to share ideas, and if you have advice on how to encourage children to share – you are extra specially welcome by me! The great news about next week too is Orchard Toys will be coming along as a special guest and will be available for a questions and answers session. They love to talk to families, and are often involved with playfest chat! They help wherever possible and value feedback from parents, this is a fab opportunity to tell them what you think of their toys and they are particularly looking for input brand new Orchard Toys product launch – Where’s my cupcake? . There will also be an opportunity to see some real life reviews of games!! 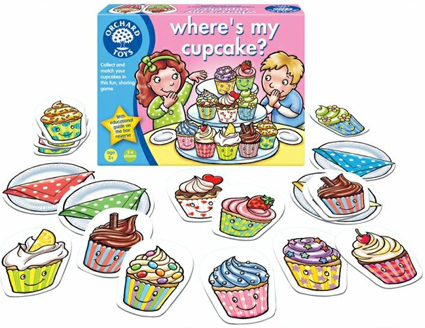 Another bonus is that if you register in advance and then participate in Play Fest you have the chance to WIN Orchard Toys games including the brand new release Where’s My Cup Cake? So get over to the Izziwizzi Facebook page and like ready for Thursday 14th June or follow @Izziwizzi on Twitter ready for Tuesday 12th June, don’t forget to register too for the added chance of winning a prize! Thanks very much for this Kel. Look forward to tweeting with you tonight!